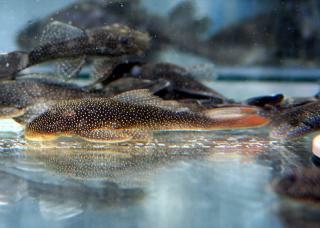 Identification Adult Lasiancistrus can be separated from all other loricariids by the presence of whisker-like odontodes on the cheeks. In addition, they have evertible cheek odontodes; three rows of plates on the caudal peduncle; and a modified, bar-shaped opercle. The caudal fin is slightly emarginate to forked, with the lower lobe longer than upper. Nuptial males have tentacules on the pectoral-fin spines longer than their associated odontodes; and transluscent tentacules on the snout that have odontodes associated with them. Nuptial males lack hypertrophied odontodes on top of the head and lack long, bristle-like odontodes on the leading edge of the pectoral-fin spine. Sexing Snout of nuptial males almost square (vs. rounded in females and juveniles). Adult males of most species (except Lasiancistrus tentaculatus) with whisker-like odontodes at anterolateral corner of snout; males of L. tentaculatus have tentacules instead of whisker-like odontodes along anterior margin of snout. Nuptial males have tentacules longer than their associated odontodes on the pectoral-fin spine. References DATZ 9/1994, pp 551-552. There are 9 registered keepers, view all "my cats" data.